Very little is known about Anthony Weiner in the UK. A former senator who seemed to have a promising career ahead of him, with his passion for the causes he believed in, he would often shout his opponents down. Until a scandal involving text messages and lurid photographs brought to the end a career that could have sent him higher than he was. 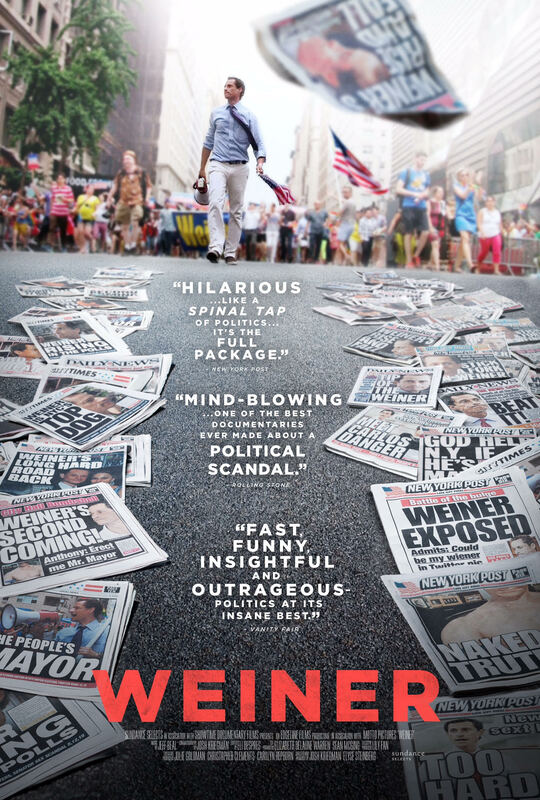 This entertaining documentary follows Weiner’s journey back into politics and what a bumpy road it is. Anthony Weiner in 2011, had to resign from his senate post due to the release of sexually explicit photographs and messages on Twitter. In 2013, after the hullabaloo died down, Weiner decided to run for mayor of New York and while occasionally hitting the question of his past, his campaign, along with his marriage to Hilary Clinton’s closest advisors when she was in a cabinet post, Huma Abedin, was going well and he was slowly winning support. Then his past came back to haunt him as new revelations appeared. Josh Kriegman and Elyse Steinberg’s film charts the rise and fall of a political career, not knowing that a scandal everyone thought had been laid to rest, would somehow reappear and with it, we watch as this man who was inches away from a shock win, slowly slips away as the press go baying for blood. It’s an incredible journey of a man who had to deal with his past to win back the favour of those around him, only to have him disgraced once more. The film is much more than charting a man’s career but an examination in the backrooms of a political career, the people who we never see trying to help a man they believe can change things for the better and a long-suffering wife, who has had to deal the humiliation once, only to go through it again. It’s also a look at how the media, desperate for a bit of gossip, will ignore the bigger picture for a slice of sleaze. In one scene, soon after the revealing of new messages, Weiner is holding a press conference about one important campaign pledge. When Weiner asks for questions, he receives nothing. When opening the questions, the press jump at the chance. The film constantly focuses on Weiner, and how he seems to want to do the right thing and yet his past doesn’t allow him. Your sympathies do shift from Weiner to his wife to the co-workers and back to Weiner, especially when one of the women he secretly texted, turns up for a photo opportunity after the Mayoral vote is over. The slightest sniff of scandal brings out the worst in people. This is a terrific film, full of insight into politics you might never know about and how a man being led by his errors of judgment, can build up an empire only to watch it crumble. It’s about how the media will latch onto a story and refuse to forgive and forget. Yet at the heart, it’s about never allowing yourself get into a situation that might come back and slap you in the face. Weiner is a funny, intelligent and entertaining documentary well worth checking out.